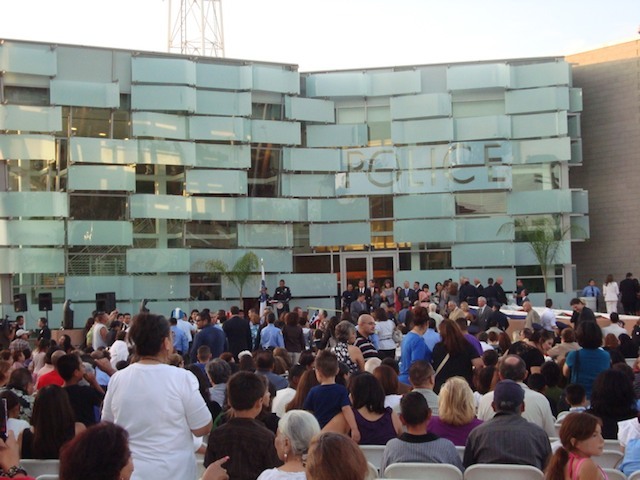 The L.A. City Council yesterday voted to rename an Eastside police station from the Hollenbeck Police Station to the Rudy de Leon/Hollenbeck Station. But it wasn&apos;t without a lenghty public comment period where an outpouring of residents spoke up on both sides of the issue. "It&apos;s very disrespectful," one resident told the council. "Mr. and Mrs. Hollenbeck donated a lot of land in the community. 8th Street was once called Hollenbeck." John Edward Hollenbeck moved to California in the late 1800s and purchased land by the L.A. River, according to the folks at Wikipedia. He was instrumental in urging the state to purchase Exposition Park, which back then was called Agriculture Park (to support agriculture in an urban area). As for Rudy de Leon, who died a few weeks after the new station opened last September, many residents were upset it wasn&apos;t initially named after him then. "He was the first captain at a time when we really had gangs," explained Teresa Marcus, a 5th generation Boyle Heights resident. "Gangs were all over and we were afraid to walk, even during the day. He reached out to the youth in his own way, he envisioned bringing the youth to the community and talking to them. He earned the respect of the community." Leon served on the LAPD for 31 years and was known for beginning a youth boxing program in the basement of the old station.